Wait. Those are two different songs. Ergo, me love you long time. Yesterday afternoon, my tiny blog welcomed its 20,000th visitor. And since it is mathematically possible but not probable for all 20,000 of those visits to be my Mom, I think you had something to do with it. And when I get love, I give love. So I am doing a 20 for 20K celebratory blog- love giveaway. In honor of this really special landmark for Let's have a cocktail, I am sending one of my great readers a $20 gift card to Starbucks. Just leave a comment between now and Friday, and then I will pick a name from my magic hat. And since I will be sitting in Seattle at that time enjoying big fun with my family and friends, I naturally chose a hometown hero: Starbucks. If you don't have a Starbucks nearby, or in the event you don't like coffee, fear not. I've got you covered. Thank you to every one of you who makes the time to read my blog. Visitors welcome. holy hell... how did you manage 20,000 visitors? i've been doing this thing for two years now, and i'm at about 4 visitors [if i'm lucky] HAHA. congrats! 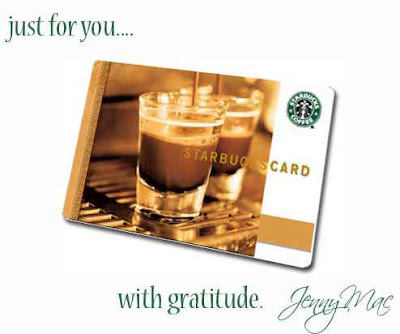 Ok...i'm FIRST :)- And since of couse STARBUCKS is originated where i live...i MUST have this card. Is it wrong that there is also a STARBUCKS inside my work cafeteria. It's fate i tell ya!!! Wow, 20,000 congratulations! Yes I think they can't all me your Mom unless she is a computer genius and has created one of those auto-bot things that create hits on sites? Starbucks is a good plan, I don't think it's possible to live somewhere there's no starbucks! Thanks for your continues writting, it brightens up my day and gives me something interesting to read over my morning coffee. Congratulations JennyMac,on this great achievement. Your blog is witty and funny and that's the reason we keep coming back. Wouldn't be lovely to see the blog turned into a sitcom? Hugh congrat's for that awesome number honey, way to go. Congratulations, JennyMac! 20,000! My small town has less than 10,000! Just thinking about numbers that high, my brain is sure to explode! YOWZA! 1. It's because you're an amazing writer. 2. If you aren't already writing a book, start now. 3. Since I visit EVERY day, I so should win. 4. Coffee is what sent me to the hospital thus letting me learn about my IBS. Again, this lets you know that the Starbucks card and I are meant to be. 5. Hubby has quite an addiction too. 6. I am overly jealous that you'll be in Seattle while I'll be in my classroom with ADHD children. Have fun for me!!! Fantastic achievement indeed. I've always wanted to go to Seattle so I'm very envious. Congrats! You have a great blog, I'm not surprised at all that you have had that many viewers! What an impressive milestone! Congrats! Cool. For the 20,000 visits and the Starbucks card! STARBUCKS!!!!! WHAT!!! Starbucks loves me long time;) I've been drinking Starbucks from New York to Spain and I love it! Congrat's on having so many people! Wow while typing this I just saw your Vistors number move up to 20,179!!! p.s. so glad to be in the Hat! And the title of this post? Cracked me up right off the bat! What is that a line from because my husband and I used to say that all the time in our best asian voice. But I can't remember what it was from? Dark Angel maybe? it looks like i started reading your blog in the nick of time! comgrats on your 20,000th! In my defense, councilor, though I do enjoy an occasional fu-fu coffee and adore hot chai tea, I love regular coffee. Just plain, black, nothing but coffee grounds and water, coffee. To the shock and awe of the disciples of Starbuck, both clergy and laymen, upon tasting a medium blend, Kenyan roast at the aforementioned Church of the Fu-fu Blend, I dumped the horrid concoction of thinned out axle grease, spent motor oil, month long flat irish stout and turpentine into the proper receptacle. If they ever get into the practice of using a french press to exude the wonderfulness that is coffee into my favoritus hot beverage, I'll be more than glad to accept your gift card should I win. Until that day give the award to someone else. Much congrats on the 20,000 and caffeine is the breakfast (and lunch...and dinner...and occasionally late night snack) of (slightly insomniac workaholic) champions! Congrats on the 20,000 visitors! That is an awesome achievement! I was stopping by your blog to say hello since you were the name above me at the SITS roll call this morning. Glad I stopped by to say hello, I love Starbucks! Hope you have a great visit with your family. Coffee...Starbucks sells coffee? Hm see this is why I come here, ya never quit teaching me new things. When did Starbucks start selling coffee? Is it a new menu item? Congratulations to you! I'm a new reader but I think you've got a terrifice blog. Congratulations! I'm a newcomer and I have to say I love your blog. I think you are beyond witty. Yes, I went there. I completely finished them lyrics out for ya. You are my hero, and if my daughter would hurry up I would be at Starbucks already. I love comments as it is, but now I really want to thank you for your comment on my blog so I could find your blog and your Starbucks gift card giveaway!!!! I love reading your blog! It makes my days of customer service that much better! Congrats. You are a great writer and seem to be quite the magnet. I don't do Starbucks though. I don't do chains at all if I have another choice. What an awesome landmark! Congrats! 20,000? YAY! Everyone can use a trip to starbucks! I really need that card. I have a 5 year old who wants to stop at Starbucks every day. Tis depleting his college fund. That is a number I'm unfamiliar with. It's just too high! Congrats! Anyone said coffee? Ah, darn small town! No starbucks. No offense to Starbucks, but if you are in Seattle's Capitol Hill district, run, don't walk, to Cafe Argento. Seriously. And congrats on 20,000! WOW! Congrats on your visitors, that's awesome! That is so exciting! I have actually been to the 1st Starbucks at the Pike Place Market. Seattle is pretty dang cool. Hub's Dad's family is from SE Seattle area Buckley to be exact.. Well have a good time in Seattle I am totally Jealous. JEALOUS I SAY! Oh yeah i would like to win the gift card of DOOM. thanks. 20,048...I may have counted wrong, definitely worth a starbucks card! How are you networking? You and LiLa... I have no idea how you girls get around. Congrats! I'm excited that there are people out there that actually read my drivel. 20,000 visitors is like the impossible dream. And I love Seattle...August and September are so beautiful. Have fun! apparently I am not the only one... that is a ton of visitors!! It's so completely evident why you have so many visitors. You are a riot! Ooooh, congratulations! I want 20,000 visitors! 20,244 visitors since January 28, 2009. As is having 421 followers - thats 400 more than I have (I only say that so I can put it in perspective for myself) and 4000+ more visits than I have had - even with a two year head start. I wish you much and continued success. How exciting for you, my friend! That many visitors... wow! I must admit, however, that it is really quite easy to visit your blog and to recommend it to others. Your wit and talent are just too good to pass up! You can thank me for visiting, but I want to thank you for entertaining me and helping me to break away from the mundane everyday. And, I truly appreciate the opportunity to win such a wonderful treat! I love me some Starbucks! 20,000 visitors. So sick. Clearly you have this blog thing down. Naturally, it helps that you have a wonderfully interesting perspective on things. That is super awesome! Nice work. Seriously? I'm a starbucks addict (just so you know) Congrats on your 20,000 visit! What? 20,000? You totally rock. Think of all those cocktails! Congrats, girl! Way to go! I can almost taste the Grande Triple Espresso Truffle no whip...ha! I think I have a long way to go!! 20,000! Wow! Congrats! I bet it's not your mom either. We don't have a Starbucks around here, but I know some friends who do. Um, I'm pretty sure that I'm going to take credit for your landmark achievement. how fun, I am drinking a starbucks as I read your blog! congrats on the 20 K hit! Congrats!!! 20k...now that is impressive! Wow! 20,000??? That's amazing!! I hope I make it that high one day! mmm Starbucks! Congrats on the 20gs! Woohoo!!! I love me some Starbucks. Count me in, dearest, and congrats - you are taking the nation by storm!! WOW, congrats!! You deserve it! Not surprised, your posts are fantastic. you are an awesome writer! just found you since you stopped in at my blog -- i think i will be having many cocktails at your blog! you are hilarious!!! thanks for the inspiration! 20,000? That is amazing! But then again, your blog is fun, creative, and interesting. Bravo to you! I am glad I found your little (or big) corner of Blog World! Congratulations on such a lofty status. I am a goat. I don't drink coffee. I drink milk. That's a pretty impressive milestone. Congratulations!! Twenty thousand...wow...I've got to get busy. I'm excited for you. So, I just thought I'd leave some love here. Like a Sarah Bariellies song. PS: My word verification word for today was "hoesses." Likes hoes. but pluralized to the nth degree. Hm...think that it's trying to tell me something? 00H-LA-LA....congrats on an incredible milestone!!! Sign me up for the blog-love-giveaway...Me and coffee are like peas and carrots (a little exerpt from Forest Gump)...sorry I know cheezy!! love your blog, oh so fabuloso!! Congratulations! I love coffee and will take that card with me to Seattle this summer!! Oh my… that is so cool!! 20,000 visitors?!?!? That is so awesome! I want in… Enter my name! BTW – Thanks for the comment! Hey, what a coincidence! We love you, too :). Seriously, though--congrats on the milestone!! I love the Banana Chocolate Vivannos! Congrats. You are much loved lady! And Celebration is my very favorite wedding song ever! 20,000 visitors...WOW!!! I can see why ~ Your blog is fantastic. This is one of my most favorite places to hang out! Lucky for you, I love Starbucks. Lucky for me, if I win. Congrats on being so effin' popular. Your blog rocks! Congrats on 20,000! It's funny, when I started blogging I was pretty sure my mom would be my only visitor too! I love Starbucks almost as much as I love my children! So I probably wouldn't mind winning! 20,000? That is excellent! Congratulations. Amongst all the other tragedies we suffer every day, not having a Star Bucks is certainly one of them on my list. But hey! That's why we import good coffee ourselves, right?! I surprassed 80 followers. That alone made me giddy. Congrats on the page views. I love your blog AND Starbucks. Now I'm not bold like you, you see I don't drink liquor but I love absolutely love coffee. Of course where I come from we make arguably the best. Hmm that's Jamaican Blue Mountain Coffee but since I'm headed over to the great U S of A on Friday, I'd love a Starbucks treat. Happy 20K! I don't know how I missed reading your blog yesterday. Apparently I am a little slow. Trust me- I'll be back. Wait, when someone says "trust me" you aren't really supposed to trust them, are you? Okay, so forget that part. Because I really will be back. I hope you have a wonderful time in Seattle. Yay to you for lots a views!! Oh and your Pay it Forward is on its way...should be there on Thursday. Happy 20,000! Congrats. That's grew news. I'm really happy for you. You've got a wonderful blog here. I really like it. Cheers! that is really amazing! Congrats. Ooooooooh very exciting giveaway ~ thanks! P.S. Random Q - did you go to Emory for law school? Congrats on 20K! You deserve it! For those that don't like coffee - try a chai latte at Starbucks. My fave! 20,000. Am.a.zing! But of course I am not surprised. You give good blog, remember? I always look forward to your posts! Congrats on the 20k! Sounds like I'm applauding the success of you completing an epic road race, but still... awesome. Congrats! And thanks for stopping by my new digs today. I love frappichinos from starbucks!!!!!! My kids call them crapachinos. They hate it when I stop for one. I just got one today to treat myself after holding it together for a full day of work with assholes. Oh... the other adults. Not the children. They really never piss me off. Who needs coffee when your words are the perfect pick-me-up! impressive! enter me please! you crack me up, I love your clever writing skills! Congrastualtions JennyMac on your milestone! And wow! I'm #114 in the comment list. I could've TiVo'd a show for the length of time it took me to scroll down the ranks. Nothing like the offer of free coffee to get people to finally speak up! Oh, how very sweet! And I don't know anyone who can't find something good at Starbucks! Congratulations! Really! I mean it. I'm not just wrangling for that Starbucks card. CONGRATS!! that's amazing!!!! so did i win? I looks like a lot of people like coffee! All these comments are right on...you are super talented and witty and it's no surprise to me that you have so many followers and visitors. Your blog is a treat to read! Congrats! Have fun in Seattle!! one of my favorite sayings.."me love you long time" that is great and great song. Wow that is a lot of visitors YOU Rock! Congratulations for shamelessly pandering yourself all over blogland!! You are my new here. When my blog grows up, I hope it is just like yours! WOW! Just...wow! That's incredible. Go, you! Oh, no. I would not "comment" just to have a chance to win the prize. I really do enjoy your writing. (I'm such a suckup --not.) You hav a really cool blog. JennyMac, you have a kickass blog. It's no wonder you've had so many visitors! Yay girl!!! You are rockin' it at 20,000! Congrats on your success and what a fun giveaway! Aww I love your blog!! 20,000 rockin' visitors? Now that's a reason to celebrate! Congrats! Hello, thanks for visiting, so glad you did, I think I may be your next biggest fan. What a fun witty blog you have here. Congrats on 20k, please enter me for the awesome prize you have selected. Could use some good coffee to wake me up from my Vicodin/hurt foot vacation! 20K visitors!! That is awesome!!! Thank you for the sweet comments! Jimmy V's speech is played every year during the weekend and I cry every time!!! I got that blue dress at a great price and it was perfect for evening!! Thank you! OOh oooh oooh! I love me some Starbucks! Congratulations! 20,000 wow that's alot of company! you must be quite entertaining! congrats! Howdy! Thanks for visiting my blog! You should totally do a post with your friend's pix from Dubai, because I sat in awe during the episode, but then I realized they were the same photos over and over again, and I want to see different ones! happy 20K!!! that's exciting. i may just have to copy you and do a lil sumthang sumthang if and when that happens. keep up the awesome blogging! Your readers bask in your glow. Whoa that is a lot of stalkers and you deserve it lady! Does the coffee come with a shot (drinker)? New to your blog...and I'm lovin' it. Glad I found you! mmm...starbucks passion iced tea!!! i always find the best books in there. congrats on your readers and hope you have a good week! Congrats on the 20,000 visitors! That is amazing and I can only hope to have a blog that popular one day! 20,000 vistors...Congrats. Happy to be one of your new followers. Hey, word gets around when you have a "good product" like this blog. Though I'm a newby reader, but I've really been enjoying myself! i love your blog! you always give me a good chuckle! thanks for that! That is truly quite impressive...so happy to be one of 20,000! I'm probably Starbucks' biggest fan...they really should give me a kick-back for all the free publicity I give them on my blog. :P I'm also a new fan of your blog...I think it's fantastic! Congrats on your 20,000th visitor! That's awesome!! I don't drink coffee, but I have heard that Starbucks has brownies to die for. And white chocolate hot chocolate. And the list probably goes on. Yum! Oh... I love Starbucks! For some odd reason we do not have them in Norway. But I'll bring my card and travel the world until I find one! Please, please, please pick me! Thanks for popping by my place; 'cause now I have a great new blog to read!! That is a lot of people. But then again, I can totally understand the traffic - you've got a great blog here. I am not a regular reader, but You can be sure I am going to make it over here more often now! I also live in Georgia, so we can talk about peaches and sweltering humidity! Better late than never :) did you know I love coffee??!! Congratulations and may you have 20,000 more visitors! Your blog is one of my faves. Sorry I have been away.